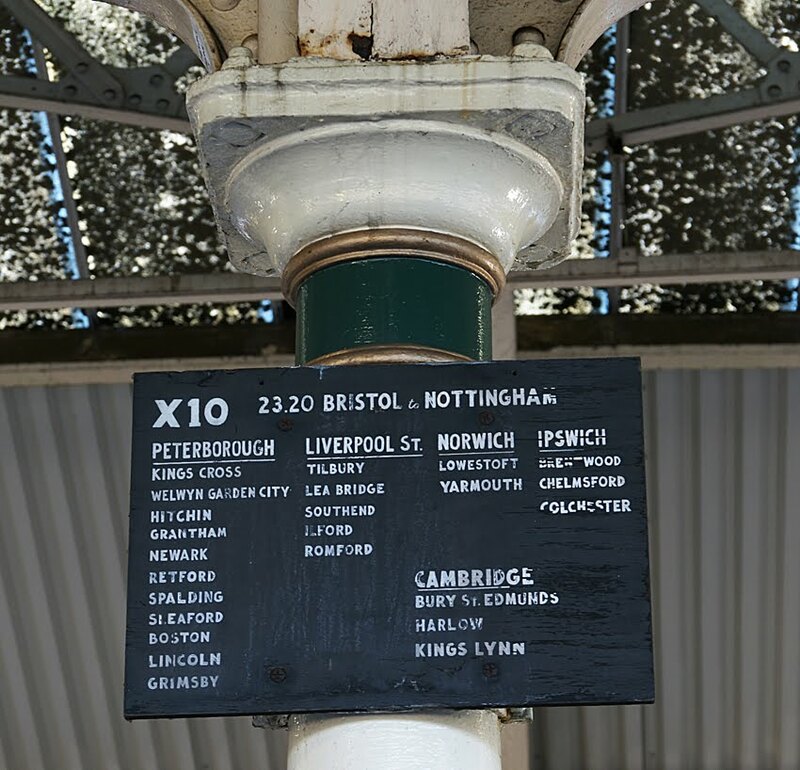 This sign on Bristol Templemeads Station intrigues me: although it's headed 'Bristol to Nottingham', the places below seem unrelated to any likely route. If anyone can offer any insights into it, I'd be really pleased to know more. Update: thank you to @albiondumsday on Twitter who pointed out that direct trains to the main destinations are available from Nottingham. That seems a plausible explanation - although any further information would also be welcome! Yes, the changes all make sense - until you try to imagine a route to Nottingham via Cambridge! The Bristol train reaches London at Paddington, so Liverpool Street is the wrong side of the city too. Looks to me like a routing board for a mail train, judging by the time. Perhaps the main stations are where mail is sorted for onward distribution. Just a thought. An intriguing thought - it would certainly make sense of why this train in particular got its own sign. I'd go with Mike's mail train scenario, and this was where carriage X10 in the train would stop, to be loaded for mail for these ultimate destinatons via the underlined places. I think that there was an overnight train between Peterborough and Liverpool St via Ipswich, so that would fit. As to when, would have to be after about the mid 1960s, which is when I think BR adopted the 24-hour clock. Thank you - I think that establishes a clear consensus for the mail train. It's wonderful to have this mystery solved!